This is a DMX signal Cable with a XLR3 female plug on one end and XLR5 male plug on the other with 36" of lead wire in between. 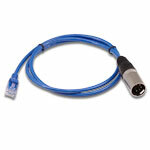 This cable will allow you to connect a DMX controller or device that has XLR5 output plugs to our PX24501 or 24 Channel DMX Drivers, or any other DMX LED Driver with XLR3 input connectors. This is a one of a kind RGB LED Kit including a string of 50 DMX controllable Digital 1 Chip RGB LED Pixel Dot Lights, a 40W 5VDC power supply with wall plug cord, and a DMX Decoder for use only with compatible 1903 IC chip. What is so great about this RGB LED kit is that each of the 50 LED dot lights is controllable using DMX control, 3 channels per LED dot for a total of 150 DMX channels per 50 unit string. 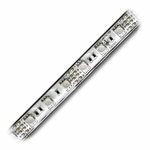 The LED dots can be cut anywhere on the 3.5" lead wire between LEDs. 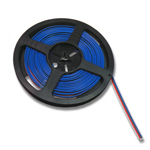 The wire length between dot lights can be shortened or lengthened to create any type of imaginable lighting configuration. Use enough LED pixels in a matrix layout to display text, color effects, images, and even video. 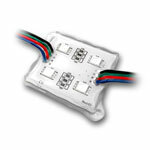 Each DMX Decoder can control 512 DMX channels, or 170 LED Pixel Lights. 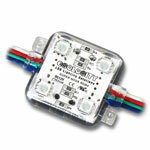 See the link to our YouTube video below for examples of the Digital 1 Chip LED Dot Light Kit in action. 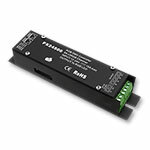 The LED Dot Modules are IP65 water-resistant all other components are made for indoor use only. This product requires a DMX Controller for use, not included.